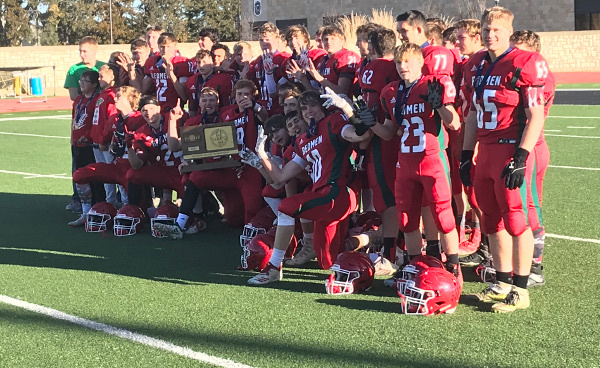 HAYS — Smith Center’s triple threat of Ethan Peterson, Colby Benoit and Hesston Maxwell out of the backfield proved to be a difference maker in the Class 1A state championship game Saturday. The trio combined for 327 of the Redmen’s 359 rushing yards in a 59-0 rout over the Eagles to claim their 10th state championship in program history and second title in a row. The Redmen put the foot on the gas pedal early with two touchdown runs of 60 and 15 yards by Peterson. Benoit rounded out the first quarter scoring with a 13-yard score and followed that with a pair of scores in the second, a seven-yard run and a 23-yard scramble. Maxwell also had a two-yard run to make it 41-0 at half. Smith Center forced four first-half turnovers against the Olpe offense, who coming into the game was averaging 38 points per game. The Redmen held the Eagles’ offense to minus-eight yards of total offense in the first half. Olpe was able to get its offense together in the final 24 minutes, finishing the game with 152 yards of offense, but could not Colby Hoelting went 16-of-34 for 187 yards and four interceptions. The Eagles’ running game was held at bay, going for negative 35 yards. The Redmen added three scores in the third quarter, a 70-yard run by Peterson, an eight-yard score by Trenton Colby and a Charlie Timmons punt return for a touchdown. Smith Center finished with 410 yards of total offense in the victory. Jaden Atwood led the Redmen in tackles with 10, added 1.5 sacks and had two TFLs (tackles for a loss). Camden Hoelting led the Eagles with 11 tackles and hauled in seven receptions for 85 yards. Olpe coach Chris Schmidt said he’s proud of what his team accomplished this season. Both teams finished their seasons with 12-1 records.